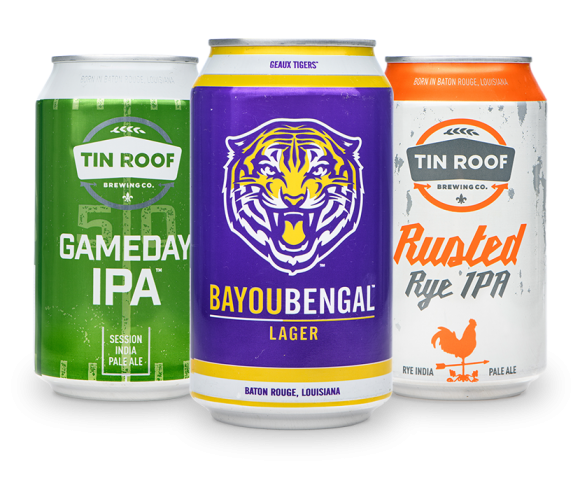 Three Month Beer Releases, One Month | Tin Roof Brewing Co.
We're doing something a little crazy this month with three beer releases. Considering the impending release of a few projects that we’ve been working hard to make happen, I figure (and marketing tells me) that I’d better take a few moments to talk to you about what they are and what you can expect. March 19th will be the official release of what we’re calling Juke Joint 2.0. As some of you already know, we morphed a malt-focused, restrained, more classic east coast style IPA into a pale, Mosaic focused, dank hop bomb of which we’re very proud. To perfect this beer, we tasted it morning, noon, and night, week-in and week-out (our lives are so difficult). Conversations among us as we passed one another between the legs of the large stainless steel tanks of the brewery might consist only of un-prefaced suggestions as to how we might improve this IPA. More Hops? Yes. Fine the beer instead of filtering? Maybe not. No bittering hop? Different yeast? Let’s try it. Back to the first yeast? Okay. We honed this beer to perfection over months of development and we’re proud to finally debut it to you in its final form – Juke Joint 2.0. Meanwhile, we had to continue the business of operating the brewery, including the development of two more beers for release this month, as I mentioned. Rusted Rye makes a triumphant return March 25th as a very pale, thirst-quenching yet not thin-bodied, citrus-y IPA with a full-on spicy rye character. I have to give Lead Brewer Danny most of the credit for developing this revamped recipe. He worked diligently on this for a couple of months and we’re all very pleased with the result of his efforts. Our next release is what we’re calling a “Tart Strong Ale,” which comes out March 31st as the first beer in our Barrel Aged Series. We blended beer that had been souring in bourbon barrels for almost a year with some fresh stout to create a decidedly complex beer with the right amount of age, sourness, and a hint of bourbon barrel flavor. We tasted each of eighteen bourbon barrel aged beers as a team and decided on the four with the most outstanding flavor to use to create this Tart Strong Ale. As always, thanks for your support. I hope to see you at the brewery for any or all of these beer releases. If you see a Tin Roof production team member there, grab him or her and tell them what you think of the beer. Frankly, I think they’re absolutely killing it. All that blogging got you thirsty? Can’t get enough Tin Roof? Subscribe to our newsletter for updates on Tin Roof brews and upcoming events. Please complete this form to get more info about renting our space and check date availability. We'll be in touch soon to reserve your date!